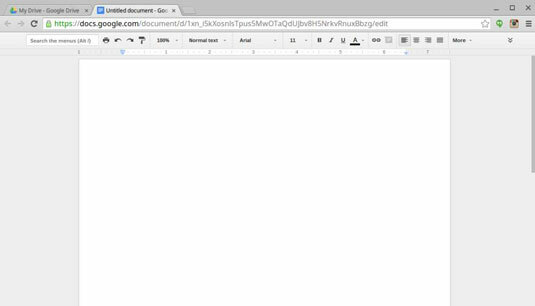 Before you begin to type out your document on your Chromebook, you might find it helpful to change your view in Google Docs. One way you can change your view is to hide the Applications menu. Just click View in the Applications menu, and in the View menu that appears, choose Compact Controls. When you do this, the Applications menu will disappear from sight, as shown here. To restore the Applications menu, click the icon that looks like two arrows pointing down located on the right side of the Edit toolbar. You can also hide the Applications menu by pressing the icon on the far-right of the Edit toolbar that looks like two arrows pointing up, or by using the keyboard shortcut Shift+Ctrl+F to hide and reveal the Applications menu. Click View in the Applications menu. In the View menu that appears, choose Show Ruler. The check mark next to Show Ruler disappears, and the View menu closes. Again, click View to open the View menu. Docs goes into Full-Screen mode. 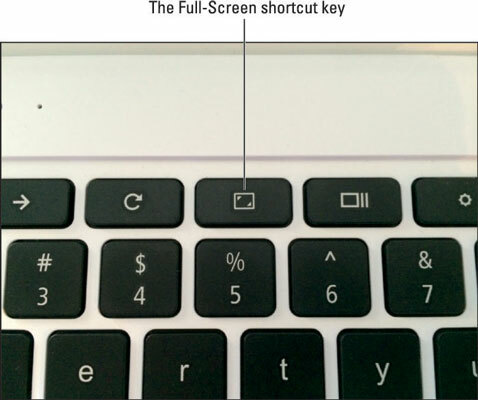 Exit Full-Screen mode by pressing Esc.